White House to devote $200M per year to STEM grants – opportunity for rural schools? Establish high-quality STEM education, with a particular focus on Computer Science, as one of the Department of Education’s priorities. Establish a goal of devoting at least $200 million per year in grant funds towards this priority. Explore administrative actions that will add or increase focus on Computer Science in existing K-12 and post-secondary programs. The announcement was made yesterday. I don’t see a lot of details – but it looks positive. They do mention the gender gap in the tech field. 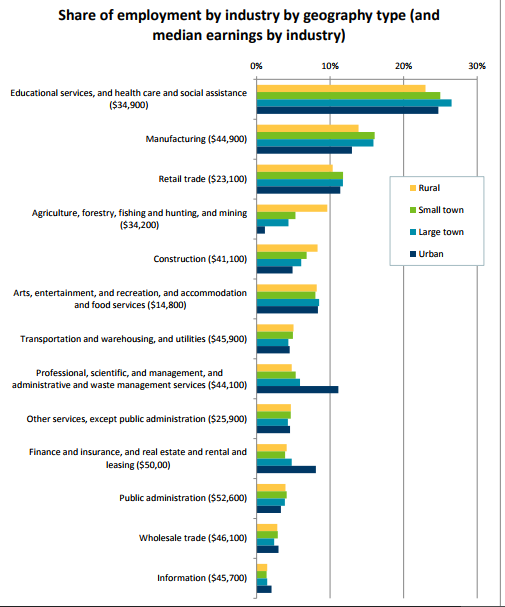 They don’t mention rural urban gap but I was just rereading a recent MN State Demographer’s report on rural areas – and from the graph you can see that urban areas have a commanding lead over other areas when it comes to “Professional, scientific…” jobs and a lead in information. So rural areas may be poised to take advantage of the opportunity. women working full-time in rural, small town, or large town Minnesota earn less than $34,600 annually. This entry was posted in education, Funding by Ann Treacy. Bookmark the permalink.